KDK manufactures gear blanks for a variety of applications in several different industries. The diameters of gear shafts can range from 5/8 inch to 5 ½ inches and their lengths range from 3 inches to 20 feet. Gear shafts are created to suit the gear configuration as dictated by the customer. Gear shaft forgings can be made for a helical gears, spur gears, torsion gears and a variety of other gear types. 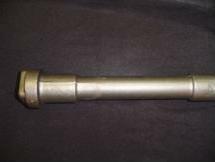 KDK can rough machine any of our gear shaft forgings to suit your needs. Crab bolts are unique forgings that KDK produces for the rail engine industry. The sizes of the crab bolts required are fairly standard. Crab bolts are a critical component of large locomotive engines. They are typically made from 4140 material. KDK has the dies for these forgings and is able make the Crab bolt according to your specifications.Crab Bolts can be heat treated or sand blasted according to your specifications. Gear blank forgings are a main product that KDK is involved with. By producing gear blanks from forgings, customers can save money on material costs and improve the strength of the overall components. There are many different types of gear shafts KDK forgings is able to produce.